Researchers have designed a "skyrmion reshuffler"—just as a card shuffler shuffles a deck of cards, the skyrmion reshuffler does the same with a type of quasiparticle called magnetic skyrmions. The reshuffler is the first low-energy, compact device that can reshuffle signals of any kind (skyrmions, electrons, etc.) with a high efficiency, which may enable it to address one of the long-standing challenges facing an alternative type of computing called stochastic computing. The researchers, Daniele Pinna and coauthors from the University of Paris-Saclay, have published a paper on the new method of manipulating skyrmions for stochastic computing in a recent issue of Physical Review Applied. Magnetic skyrmions are tiny defects in a magnetic field where the magnetic field is reversed. One of their interesting properties is their ability to move freely along the two-dimensional surface of the magnetic field. When many skyrmions come together, their high mobility causes them to act as a freely moving gas in two dimensions. In recent years, magnetic skyrmions have captured the attention of researchers because their tiny size (roughly 10 nm) and high mobility suggest that they have the potential to serve as information carriers for future miniaturized, high-speed, low-energy devices. So far, however, most of the work in the emerging field of skyrmionics has used skyrmions in one-dimensional tracks, rather than taking advantage of their full two-dimensional freedom. The skyrmion reshuffler presented in the new study is one of the first devices to harness the dynamics of skyrmions as a two-dimensional gas. The reshuffler receives an input stream of skyrmions and thermally reshuffles their order, while still maintaining the same skyrmion states as in the original stream. That is, if the skrymions were encoding data using 0's and 1's, then both the input and output bitstreams would have the same number of 0's and 1's. Consequently, the probability of finding a 1 (referred to as the p-value in this context) would be the same in either bitstream, meaning that the p-value is conserved. As it happens, reshuffling while conserving p-values is exactly what's needed to perform certain operations using an alternative type of computing called stochastic computing. "The greatest significance of this work is, in my opinion, having rid skyrmions from the 1-D shackles they have been forced to live in," Pinna told Phys.org. "At every magnetism conference, research work on skyrmions preambles with their potential use for racetrack memory applications. [But] skyrmions are intrinsically 2-D objects with extremely interesting mobility and spatially extended properties. 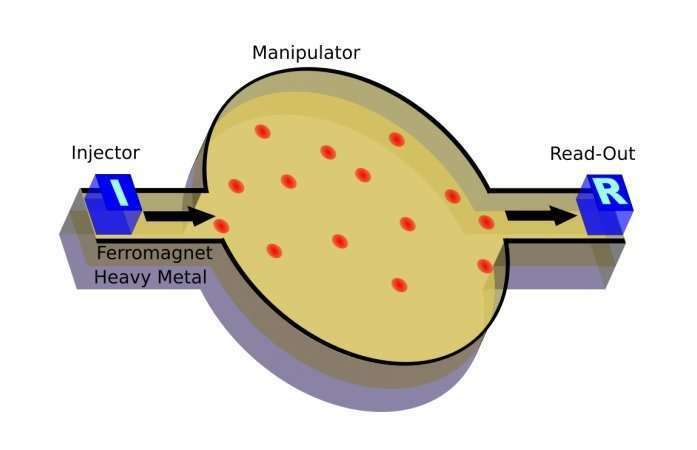 My work (past and current) attempts to design, theorize and demonstrate novel devices in the realm of unconventional computing where I firmly believe that nanomagnetism and spintronics can pave the way for the development of scalable and energy-efficient analog computational devices." In traditional computing, data is encoded as an ordered string of 0's and 1's, and operations are performed on the data by precisely manipulating these binary digits. In stochastic computing, on the other hand, data is encoded in bitstreams of random 0's and 1's where the order does not matter. Instead, the important thing is that the probability of finding a 1 in any given position in the bitstream, i.e., the p-value, corresponds to the value of the data being encoded. One of the main advantages of stochastic computing is its error-tolerance. If one bit in a string becomes flipped, then in the traditional computing scheme that minor error completely changes the value of the encoded data. In stochastic computing, however, a flipped bit only slightly changes the probability of finding a 1, and in a sufficiently long bitstream the effect is negligible. This advantage becomes especially important when electronic devices are scaled down to the point where errors become more frequent, resulting in the need for error-correcting codes in traditional computing. A stochastic computing device can perform arithmetic with p-values, but, due to the way these calculations are implemented, the device often does not give the correct answer when the two input bitstreams are identical—that is, when they have the same 0's and 1's in exactly the same order. To address this problem, the signals must be reshuffled while conserving the p-values. Although reshuffling signals can be done using pseudo-random number generators, these require large memories and consume large amounts of energy. The skyrmion reshuffler uses orders of magnitude less memory and energy than these devices, suggesting that it may offer a low-energy, high-efficiency solution to this problem. The researchers also showed that, with some modifications, the skyrmion reshuffler can function similarly to a biological neuron. When a neuron receives electrochemical signals from other neurons, it integrates the incoming activity and, if the activity is sufficiently high, it sends out a voltage spike of its own. Neurons are also "leaky" in the sense that, when they do not receive signals, their voltage slowly decays over time. Similarly, when the "skyrmion neuron" receives a bitstream of skyrmions as input, it accumulates the skyrmions in one of its chambers, and then sends out a reshuffled bitstream. Moreover, when skyrmions are crammed together too tightly, they begin to annihilate, emulating a leaky neuron. The researchers expect that both the skyrmion reshuffler and skyrmion neuron may one day serve as the building blocks of future spintronic stochastic computers. "The skyrmion reshuffler is actually a very versatile device," Pinna said. 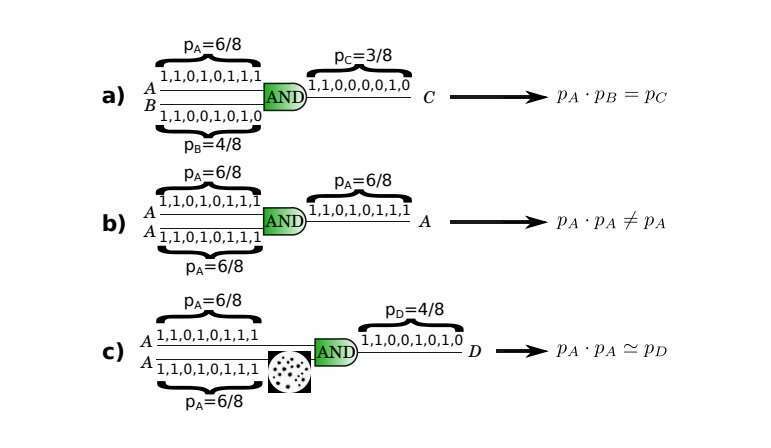 "On top of reshuffling telegraph noise signals (or, equivalently, bitstreams), it can also be used to generate bitstreams with well-defined p-values. In fact, by injecting skyrmions in specific ratios in the device's two chambers, the device effectively takes an imposed p-value as input and outputs a scrambled stream of skyrmions defining it. Although this is probably more efficient to implement with super-paramagnetic tunnel junctions, it does turn out to be pretty elegant that the same device can be used to both scramble and generate random bitstreams. "The skyrmion neuron is a smaller tassel in the big picture of neuromorphic techniques in magnetism. It is of great interest to study all the ways we can functionally reproduce a neuron's behavior in condensed matter systems. The philosophy behind it is that one can then attempt to construct analog neural networks bottom-up by coupling many such elements together."